Real Madrid won their last game of the season aftear beating Almeria by an impressive 8-1 result in the Santiago Bernabéu stadium. 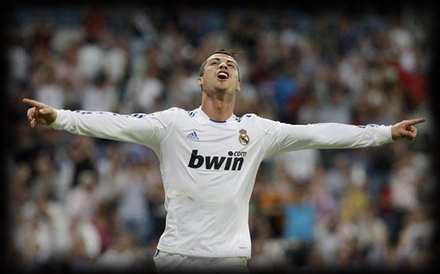 Cristiano Ronaldo proved why he is regarded to be the most complete player of all time. CR7 scored another 2 goals tonight (having now scored 11 goals in the last 4 matches) and broke the Spanish League 38 goal record, after scoring 40 (41*) goals in La Liga 2010-2011 season. * La Liga claim that Cristiano Ronaldo has 40 goals, while Marca.com (responsibles for the Pichichi award), say that Ronaldo scored 41 goals. Please read the text to understand the reasons. There was not much at stake in tonight's match, as Real Madrid and Almeria closed the season before going on vacations. However, all attentions were on Cristiano Ronaldo in order to see if CR7 was able to add more goals to his personal record. As expected, Ronaldo scored twice tonight and completed a tremendous season with 40 (41*) goals scored in the Spanish League and 53 (54*) in all competitions, while playing for Real Madrid. The 8-1 victory was the perfect way to say goodbye to the fans and Adebayor (3 goals hat-trick), Karim Benzema (2 goals) as well as Josue also joined the party and helped smashing Almeria hopes of a good result. Is someone still confused on how many goals Cristiano Ronaldo scored this season in the Spanish League "La Liga"? We'll explain it one more time, to avoid misunderstandings: La Liga's official report and statement insist on saying that the winning goal in the match Real Sociedad vs Real Madrid (18-09-2010), was scored by Pepe. The goal comes from a powerful Cristiano Ronaldo freekick, that ended by getting deflected on Pepe's back, before beating the goalkeeper. You can watch that goal here. Spanish newspaper, Marca.com, are the ones responsible to deliver the Pichichi award and they claim that goal to belong to Cristiano Ronaldo, while "La Liga" official report still says it should belong instead to Pepe. That's the reason why some sources on the internet may say Cristiano Ronaldo ended up this season with 40 goals in the Spanish League and others will keep saying CR7 scored 41 goals in La Liga. Since Hugo Sanchez and Telmo Zarra goal record was at 38, there will be no big further discussion on this matter, as Cristiano Ronaldo is now the all-time goal record breaker in La Liga having also won the Pichichi trophy in the Spanish League 2010/11 season. As for the match itself, Real Madrid found the perfect way to say goodbye to the Santiago Bernabéu and their fans with a tremendous 8-1 win. Cristiano Ronaldo scored 2 goals and assisted his teammates for another 2. One of this match highlights was also the moment when Dudek got substituted, since this was his last career game, as he will retire in the end of this season. The entire team and the fans gave him a huge and deserved ovation. The game started with Real Madrid pushing Almeria to their own half, and Cristiano Ronaldo didn't lose much time to end the controversy and discussions about the 38 goal record tie, and scored just around the 4th minute, after Sergio Ramos headed a ball into the 2nd post. The game went on and Real Madrid controlled it for most of the time. CR7 ended up by scoring the goal of the night, in a great run around the 77th run and a world class finish, leaving no chances to Almeria's goalkeeper to stop the shot. Real Madrid now ended the season and players should go on vacations in the next days/weeks. We'll try to keep bringing you all the latest news about Cristiano Ronaldo and where CR7 will spend his vacations.